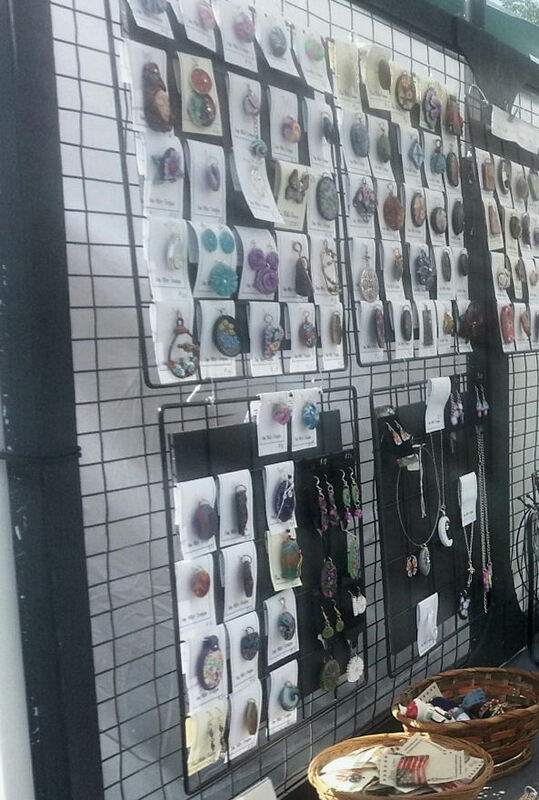 How I do my jewelry display set up for shows. I make alot of pendants & earrings and some sets, mostly out of polymer clay. I've gone thru trying many, many ideas but have finally arrived at a convienent, fast way to hang my items. My wonderful husband built the standing wire racks that are behind all of my tables. 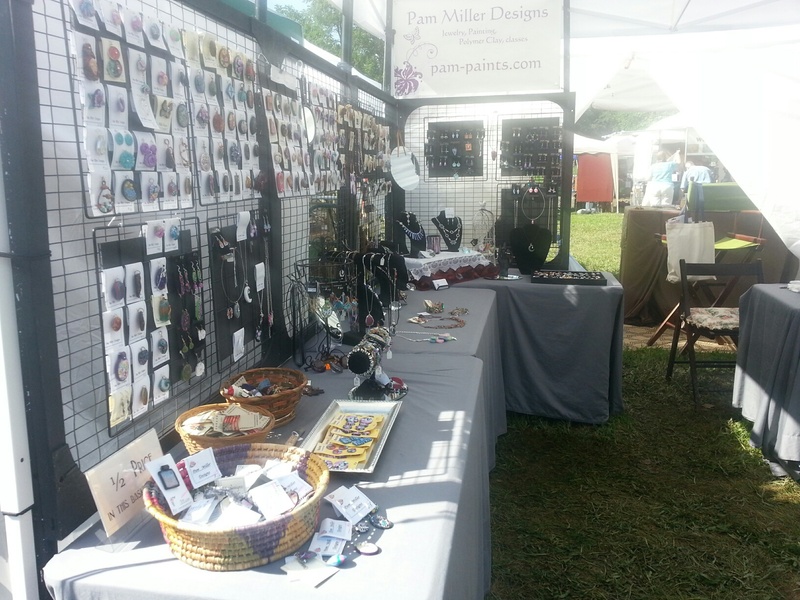 There are 2 that are lengthwise, hinged with(2) 3x3' sections for jewelry and 2 for my paintings that stand verticle and all attach to the top of our tent. Poles are pvc piping painted black. I found a box of these racks that you put together to create a shelving unit. Its brand is "closetmaid". I got them at Target on clearance so I'm not sure where to get more. 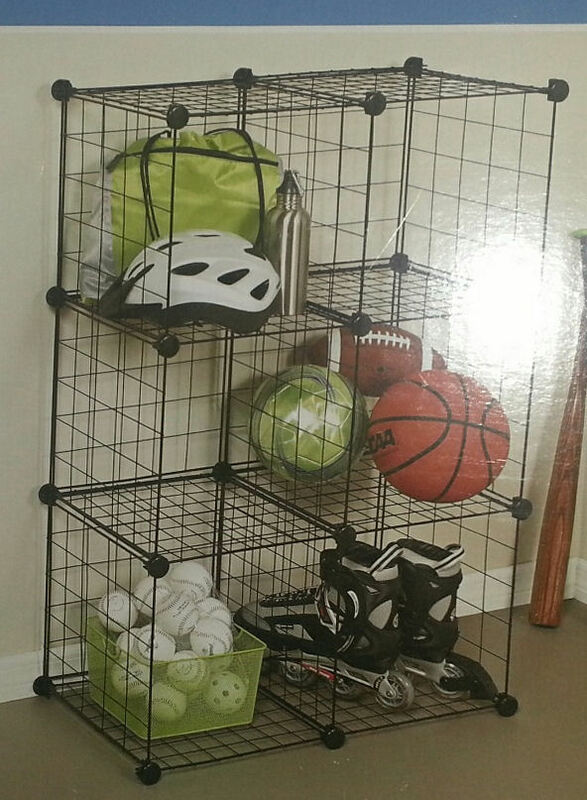 *Note that the "bottom" of each shelf has smaller wire openings but they will work too. I use each section and attached black foam core to the back of the rack using wire. I intended to cover the whole rack but measured wrong and cut them ALL a little smaller but they still work. lol. I added 2 hooks at the top of each one to hang them onto my displays that my husband made. I make my own business cards that I attach my pieces to. 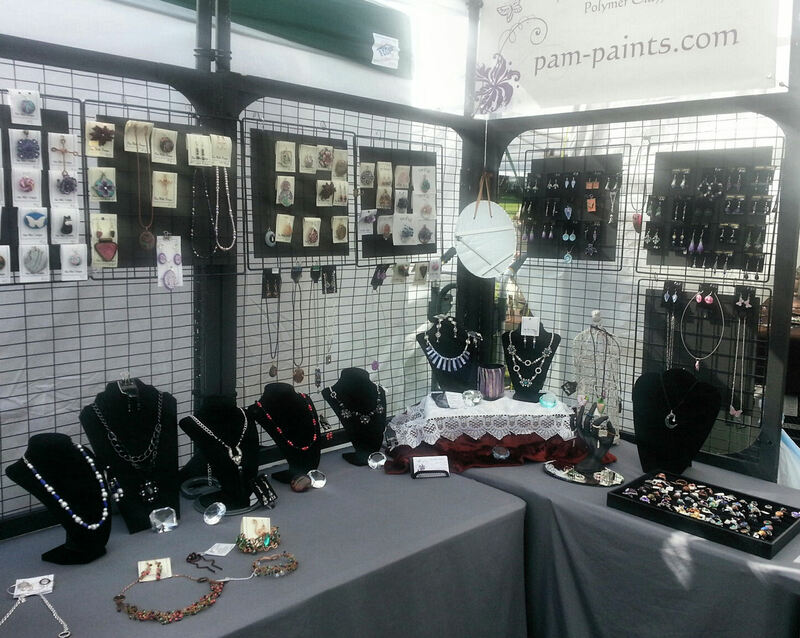 (I use a white fabric covered spool of wire found in the floral section at michaels & hole punch to attach jewelry). I wrap each rack with heavy duty , wide aluminum foil & wrap it up the bottom and around the sides just 2" or 3 " but do cover the fronts. I store them in a tote that I had to make sure to measure so they all fit in. Each rack is 15"x15". I found one at Walmart. Its really quick and easy to unwrap them and hang them and most don't fall off. My cards will fold over and fit into the spaces of the racks with the larger openings tho. I hope this helps someone just starting out. I think you could use a variety of items to hang the racks on. (Shutters, Screen etc. )and no you can't borrow my husband to make some. lol. I do wish I'd made the foam core pieces larger tho. Holler at me if any questions.